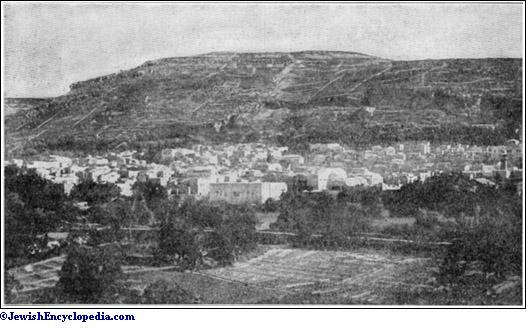 Mountain south of the valley in which Shechem was situated; the present Jabal al-Ṭur (Deut. xi. 29, xxvii. 12; Josh. viii. 33; Judges ix. 7). It is 2,849 feet high, declines sharply to the north, and is sparsely covered at the top with shrubbery. After their separation from the Jews the Samaritans built a temple on it, which was destroyed by John Hyrcanus. But the mountain continued to be (John iv. 20), as it is to-day, the holy place of the Samaritans, reverenced by them as the scene of the sacrifice of Isaac and as the site of their temple, and upon which they still celebrate the Passover. The temple was surrounded by fortifications (comp. II Macc. 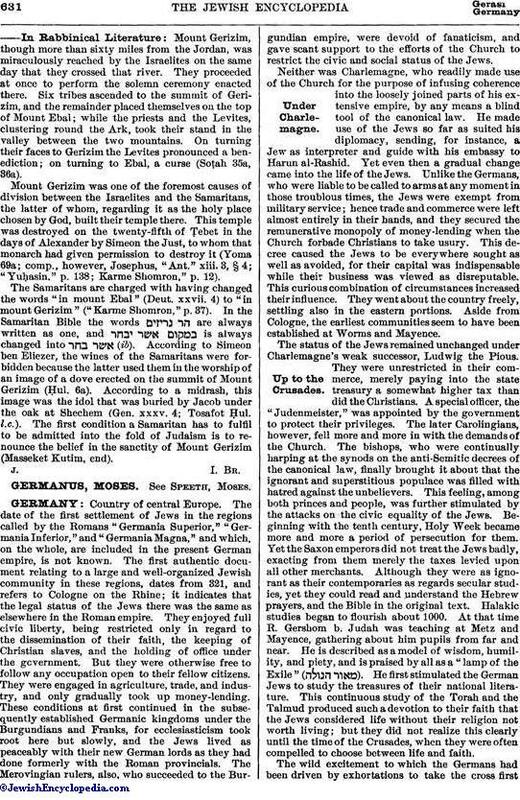 v. 23), which survived the destruction of the temple (Josephus, "Ant." xiv. 6, § 2; xviii. 4, § 1; "B. J." iii. 7, § 32). After Christianity had secured a foothold in Shechem, there were frequent disturbances among the Samaritans, on account of which Justinian in 529 built a wall round the church which had been erected on Gerizim, to protect it; the line of this wall is probably to be seen in the extensive ruins still existing on the top of the mountain. Among others there are some ruins called "Lozah," the "Luza" mentioned by Eusebius ("Onomasticon," 214, 135), nine (Hieronymus says three) Roman miles from Shechem. Gael, Altisraelitische Kultstätten, pp. 102 et seq. Mount Gerizim, though more than sixty miles from the Jordan, was miraculously reached by the Israelites on the same day that they crossed that river. They proceeded at once to perform the solemn ceremony enacted there. Six tribes ascended to the summit of Gerizim, and the remainder placed themselves on the top of Mount Ebal; while the priests and the Levites, clustering round the Ark, took their stand in the valley between the two mountains. On turning their faces to Gerizim the Levites pronounced a benediction; on turning to Ebal, a curse (Soṭah 35a, 36a). Mount Gerizim was one of the foremost causes of division between the Israelites and the Samaritans, the latter of whom, regarding it as the holy place chosen by God, built their temple there. This temple was destroyed on the twenty-fifth of Ṭebet in the days of Alexander by Simeon the Just, to whom that monarch had given permission to destroy it (Yoma 69a; comp., however, Josephus, "Ant." xiii. 3, § 4; "Yuḥasin," p. 138; Karme Shomron," p. 12). The Samaritans are charged with having changed the words "in mount Ebal" (Deut. xxvii. 4) to "in mount Gerizim" ("Karme Shomron," p. 37). In the Samaritan Bible the words are always written as one, and is always changed into (ib). According to Simeon ben Eliezer, the wines of the Samaritans were forbidden because the latter used them in the worship of an image of a dove erected on the summit of Mount Gerizim (Ḥul. 6a). According to a midrash, this image was the idol that was buried by Jacob under the oak at Shechem (Gen. xxxv. 4; Tosafot Ḥul. l.c.). 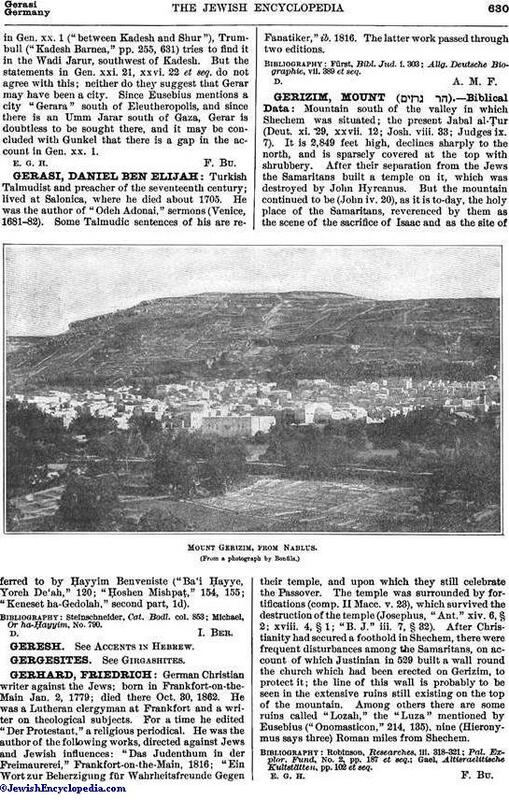 The first condition a Samaritan has to fulfil to be admitted into the fold of Judaism is to renounce the belief in the sanctity of Mount Gerizim (Masseket Kutim, end).